Property Owners: List your Auvergne property on the premier site specialising in French holiday lets. More Info. 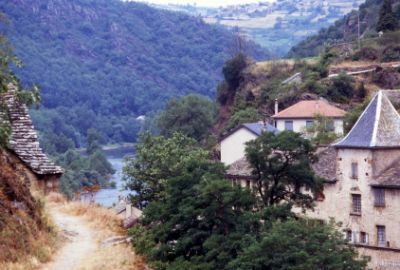 View gites and villas in Auvergne. One of the best ways to explore Auvergne is through a villa or gite holiday, as they give you the freedom to go where you please, whenever you want. Auvergne gites are very welcoming and ensure the visitor has a very pleasant stay. The same can also be said of Auvergne villas. Staying in either one will give you a good idea of what it’s like for the region’s native population as they go about their daily lives. If you’re feeling fit, the mountain climbing and hiking is just made for you. The highest peak is around 2,150 metres. Auvergne is also the most volcanic area in Europe. The volcanoes are not all extinct, and signs of their underground activity can be seen and felt in the hot springs at Chaudes Aigues in the Cantal, where the water bubbles from the ground at 82 degrees, hotter than any other spring in Europe. Le Puy-en-Velay is an interesting historical town that is well worth a visit, even if it is a little difficult to get to. Sited in the Massif Central, it’s rather isolated, being surrounded by not just high hills, but also conical volcanic forms that the region is renowned for. It’s popular both with visitors and pilgrims, as its cathedral marks the beginning of one of France’s main pilgrim routes to Santiago de Compostella. One of the most remarkable sights in the town is the Chapel Saint-Michele d’Aiguilhe. Built on a rocky pinnacle, eighty-five metres high, in the tenth century, you have to climb 268 steps, carved into the rock, to reach it. It’s quite an experience, both visually and physically. Le Puy is also famous for its lace-making industry, and you will find plenty of lace shops as well as a museum dedicated to the art. Auvergne possesses a rich history, and there are lots of castles, dungeons and Romanesque churches with a tale to impart to the inquisitive traveller. However, the region isn’t all about the past, and it boasts many modern attractions as well. Apart from the Vulcania theme park, dedicated to its volcanoes, there are a number of scenic railway tracks, cable cars to ascend the mountains in comfort, and many opportunities to indulge in such sports as kayaking and rafting. Auvergne is a predominately agricultural region, evidenced by its production of fine cheeses. Cantal, Saint-Nectaire, Bleu d’Auvergne and Fourme d’Ambert are just four that you should put on your “to eat lots of” list. The cuisine is by and large simple and rustic, but none the worse for that. The region is famed for its Charolais beef and its pork products, with dried meats and cured sausages benefiting from being treated in the crisp mountain air. Many of the traditional recipes combine pork with basic vegetables such as potato and cabbage. Potée Auvergnate, a tasty, traditional hotpot, and Aligot, which comprises a number of savoury ingredients wrapped in sheep’s tripe before being slowly braised over a low heat, are two dishes you should definitely try.